Intuit® currently helps more than 1.3 million businesses process payroll and file taxes annually, so what could Intuit add to its payroll platforms that would make everyone take notice? How about Direct Deposit for independent contractors? This has been a high priority feature and now QuickBooks® Payroll (QBO Payroll) is bringing it to you! In addition to helping businesses with employees run payroll more efficiently, QuickBooks payroll now supports businesses that want to pay independent contractors. By choosing a QuickBooks payroll solution, you can feel confident that you are easily able to pay your entire workforce. You can now provide a worry-free payday to your workforce, including employees and contractors. QuickBooks Payroll allows you to pay everyone by direct deposit and handles all your accounting and payroll details. “It really simplifies my operations and bookkeeping,” says Leah Welsh, owner of Strategic Accounting Solutions, LLC. “With checks, I have to worry about when each contractor will cash the check and I have to check the account to make sure I always have enough in there. With direct deposit, I always know when the money is coming out and how much I need to have in my bank account. And, I don’t worry about when I need to give my contractors their checks; I can send them direct deposit payments from anywhere. 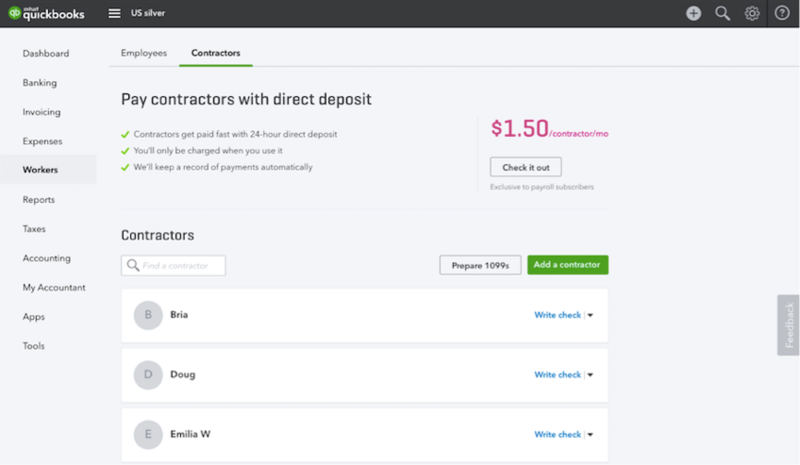 QuickBooks Contractor Direct Deposit also cuts down on the back-and-forth you have with your contractors. No more back and forth printing checks, and figuring out how to the get the payment to your contractor. QBO Payroll now lets you do your payroll right for all your workers, including W2 employees and independent 1099 contractors. Try it today!